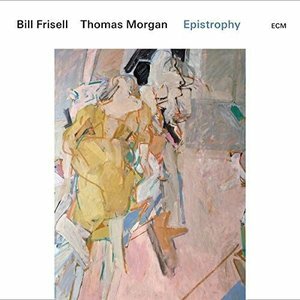 Just as the Bill Evans trio had split a weekend's worth of gigs into the two live albums Sunday at the Village Vanguard and Waltz for Debby, guitarist Bill Frisell and bassist Thomas Morgan have divvied their Village Vanguard sets into the companion albums Small Town and Epistrophy. Both feature Paul Motian tunes, both include John Barry covers from James Bond films, and both were released on the ECM label. If Small Town did something for you, then so will Epistrophy. The same holds true for the opposite scenario. The two albums, while not exactly interchangeable, share a great deal with one another below the skin-deep level. Frisell's fretboard approach to jazz and Americana hasn't changed a great deal over the past 25 years or so. Morgan, meanwhile, brings the complimentary shading that enables Frisell to act as an Evans/Coltrane mutant while still sounding like no one but himself. Much like Miles Davis, the Frisell and Morgan duo have an open-minded approach to selecting cover material. Show tunes? Why not. They've got Kern and Hammerstein's "All in Fun" ready for you. A soul hit from the 1960s? They got that covered too with the Drifters' "Save the Last Dance for Me". And Frisell's Americana itch gets scratched with "Red River Valley" and the Carter Family's "Wildwood Flower", the latter being welded to the Drifters cover in a medley. Then there's "Lush Life" and "In the Wee Small Hours of the Morning", two old standards from two very different worlds of popular music that must rarely find themselves cohabitating on a single album. Then there are the two Thelonious Monk covers, one of which was the inspiration for not only the album's title but its cover art as well. Bill Frisell's family were well-acquainted with the painter Charles Cajori when he was growing up, and he somehow secured the rights to use his painting Epistrophy for his this album. The other Monk cover in question is "Pannonica", a light, airy number that stands in sharp contrast to the loopy melody of "Epistrophy" with its leap-frogging tri-tones. The only time Frisell's playing becomes a little strange is on the Paul Motian original "Mumbo Jumbo". Halfway through, he turns on an effect that adds digitally ghostly overtones to the notes that he's playing. To his credit, Thomas Morgan has also performed with Motian in the past and Frisell credits him for "show[ing] me things in the piece I didn't realize were there". How that plays into what you're hearing here, I'm not certain, but anything that brings new life to an old piece certainly can't be misguided. Epistrophy is a soft, intimate album where all of the subtleties are buried at the earbud level. The Village Vanguard audience is quiet and respectful during the performances and even restrain themselves during the applause, with the exception of when "You Only Live Twice" wraps up. Then, everyone gets loud. It's not exactly a rockin' rendition, but Frisell's use of reverb coupled with a full-bodied tone must have done something to those New York folk to get such a response out of them. For them, Epistrophy is a worthy keepsake. For everyone else, Epistrophy and Small Town are exquisitely produced footnotes tucked inside a long career.